Hoooooly holo do I have a treat for you! 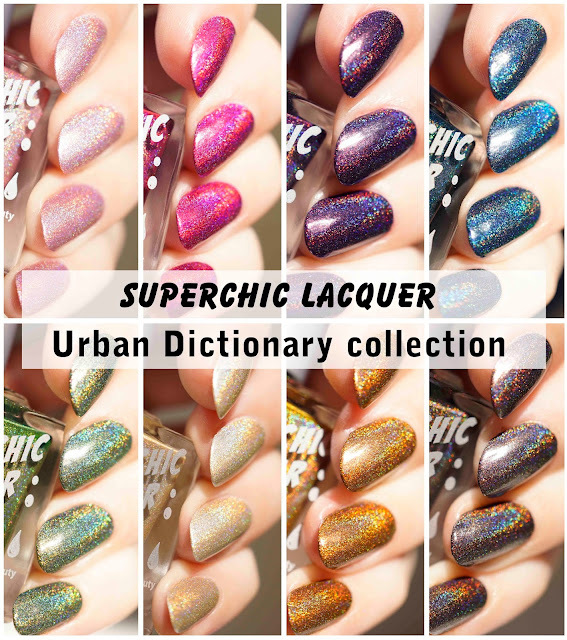 The Urban Dictionary collection by SuperChic Lacquer has been available since September so you have probably seen these around already. Maybe even in this nail polish seduction video I made :-p Nonetheless, these amazing polishes deserve all the attention they can get! All of these are shown without top coat. They dry amazingly fast and they're so opaque that there's only one coat needed, so I crowned them my go-to polishes when I need something pretty and interesting on my nails in an instant. Let's kick this party off with Rosebuddy! She's a light pink shade with plenty of holo. One coat is *almost* enough, but I used 2 coats for perfect opacity. It's a really sweet color and the perfect softness to offset all the sass that this collection brings. Also, it combines really nicely with the other shades to bring the best of both characters! Back from the grave is Zombie Crush! It's dark, oh so dark, like deep space, and the holographic particles sparkle like a cluster of stars. I could definitely stare at this one all day and happily go blind. Or have my brains munched on. 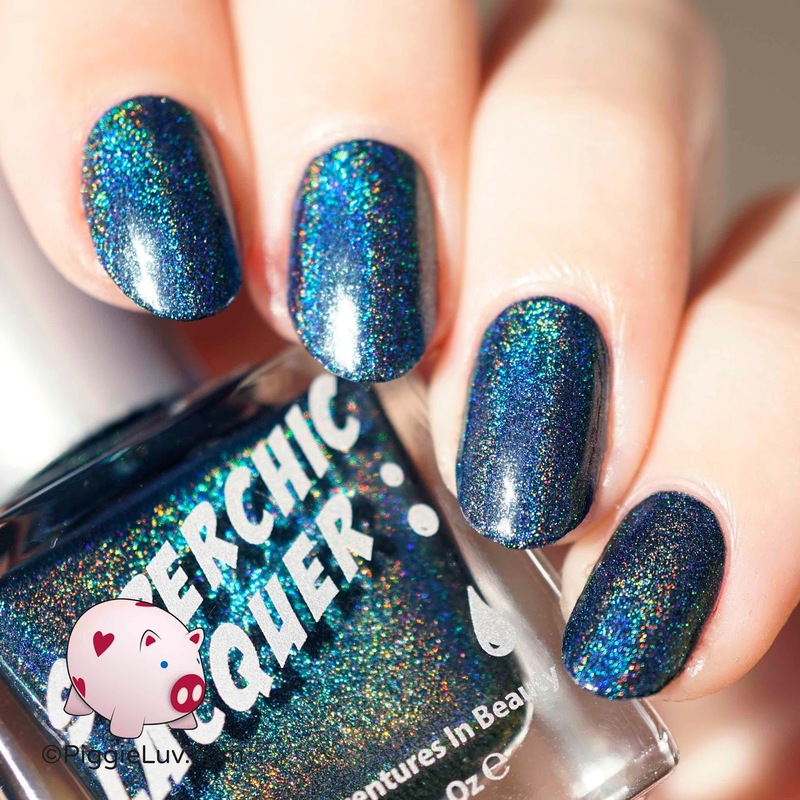 This lovely number is so opaque that one coat might even be *too much* opacity, or wait... is that even possible? Did someone say 'Deadpool'? Dive right into this deep blue mess of murder and inappropriate humor because it is ON! 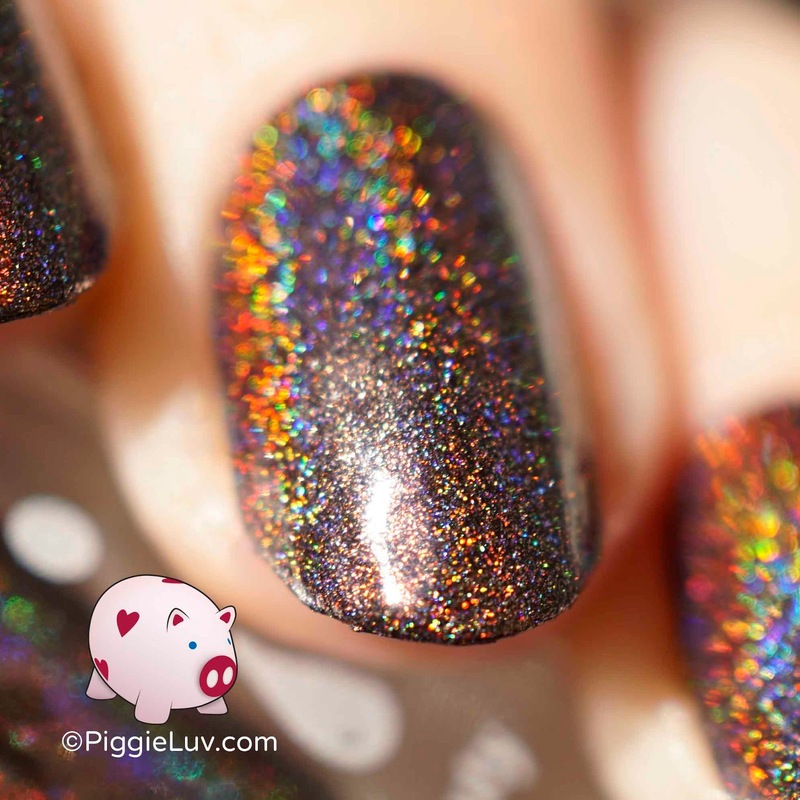 The holo is on point (I dare not say fleek) and sparkly, and the color is dusty & perfect. I love that this is not your standard run-of-the-mill blue but a nice unique jewel toned kind of blue. Oh and did I mention ONE COAT? Oh Awkward Turtle, how olive you! This color doesn't usually draw my attention, but it matches so well with the rest of the collection that I have plans for this one. Naughty, naughty plans... I only needed one coat to reach opacity and look. At. That. Rainbow! 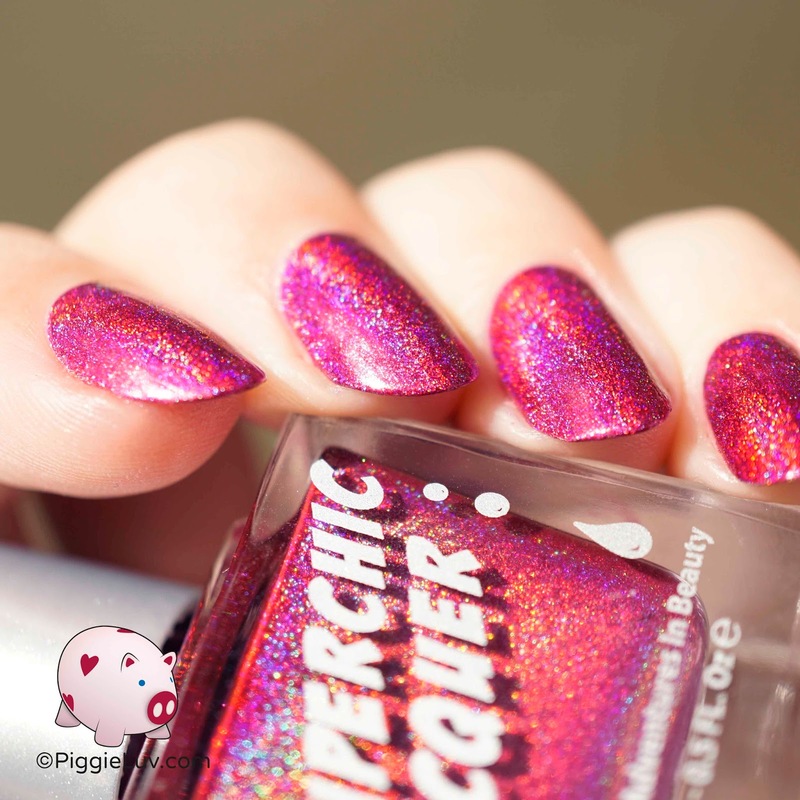 Wonderwall is a bit more shy than the other polishes in this collection, showing its holo only in the right circumstances. After one coat, I could see a couple of thin spots so I added a second coat before taking these pictures. It's to be expected with such a light color, and totally not an issue because of the fast drying time! The best thing about Wonderwall is that it can be combined with any of the others in this collection and it'll look exceptionally classy. Ooh capuccino swirls in my brain as I take in the sight of Rum-Billie! 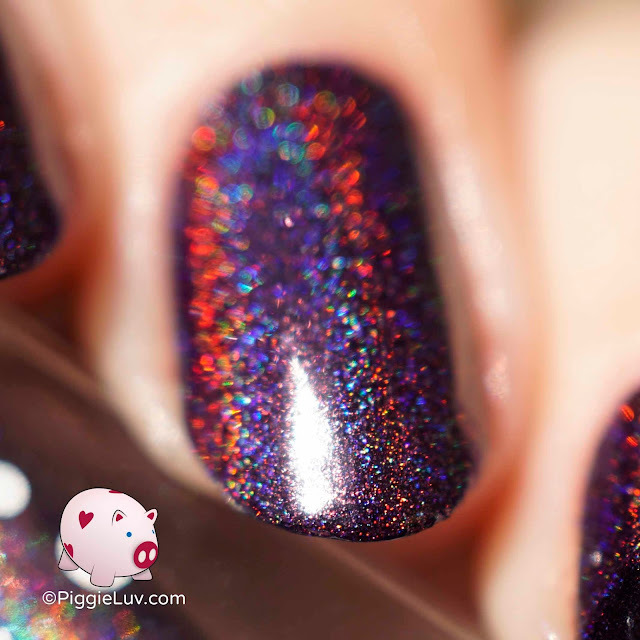 The holo, the deep color, the formula... if there's a holo grail, this would be it. I only needed one single coat to get this result, and I'm running out of words to tell you how amazing it is... Fire? Sunsets? The kinda color you get when you mix weird stuff with your coffee? Lastly, but certainly not least, is Awesome Sauce. Somebody hand me a wet towel because I'm going to faint! The holo is strong in this one, the dark chocolatey color definitely accentuates it in all the right places (if you know what I mean) and brings it out in all its rainbowy glory. ONE single coat, it's amazing! Wow! That's all of 'em! Well I'm gonna need a bucket... My favorite is all of them, and my least favorite is none of them. I haven't been this excited about a collection in I don't know when! Which one do you definitely need in your collection? The one you can't live without for another day? Be sure to hit up SuperChic Lacquer on the following channels: Facebook, Instagram, YouTube and Twitter. There's a ton of swatches to find, restock info, videos... Plus Jen is just a real character, sweet & sassy and so funny! I really hope you enjoyed reading and watching this review, and please come back sometime!